Don't count your chicks until they've flown the nest! I love to watch movies. They were all good movies, and I enjoyed them for different reasons. The only movie on this list that I felt shouldn’t have been there was American Sniper. This was a big budget film with a high-powered director, Clint Eastwood. I like Clint Eastwood as a director more than I like him as an actor. I love the way Bradley Cooper portrayed Chris Kyle. What I didn’t like and thought should have removed this movie from contention was the use of an animatronics baby in two scenes. The fake baby was obvious and creepy and, artistically, a big fail. I know that having a real, live baby in a film is a hassle and, according to reports, there were two lined up for these scenes. One was sick and the other was a no-show. So, rather than delay the filming of the scenes, Eastwood decided to use the fake baby. For me, that was a big mistake in a big budget film. So my objection to its nomination was in no way based on all of the controversy surrounding the film. It was simply an artistic issue. 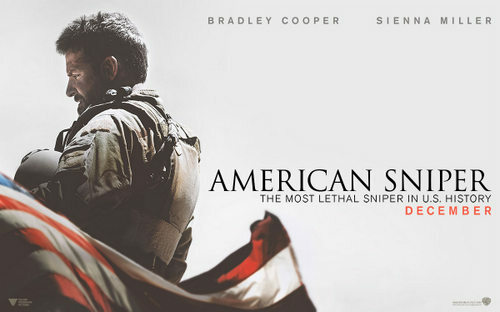 American Sniper was nominated in other categories including Best Actor for Bradley Cooper, who I think did an outstanding job in this role, and the film won for Sound Editing. I had no problem with its other nominations and its one win. When I commented about this film on Facebook, I was surprised at the responses. Again, my opinion is based on the artistic merits not the subject matter. It seems if you object to anything related to our military all of a sudden you are anti-veteran or anti-American. I did not consider the controversy over Chris Kyle, his book and the lawsuit, or questions about his truthfulness in telling his stories in my assessment of the movie (for more on the defamation and unjust enrichment lawsuit which Kyle lost read this). I liked the movie American Sniper. I just didn’t feel it was deserving of a Best Picture nomination at the Oscars. I also read a review about the movie that said it followed Chris Kyle’s book closely. I decided to read the book, so that I could provide a more thorough review. Unfortunately, I was 439 on the reserve list at the library, and I just received and finished the book this past week. After reading the book, I feel that the screenwriter, director, and actors did a really good job portraying the lives of Chris Kyle, his wife, and others as written. Taya Kyle, Chris’ wife, included an excerpt at the end of the book edition I read that confirmed that she felt that they had done so, too. There were a few liberties with details in the movie that differed from the book, but they did not take away from the overall accurate depiction of Kyle and his life. I rated the book 2 out of 5 stars on Goodreads. Its average rating is 3.98 out of 5 so my rating is below the average. I did not give it this rating because it was poorly written. I gave it a reduced rating because of the actual story. What did I like about the book? I enjoyed learning about the training and the weaponry and am amazed at how resourceful soldiers can be when they have a goal but are faced with bureaucracy and other obstacles and challenges. What did I not like about the book? I did get tired of what I considered to be braggadocio. The actual facts of the excursions and experiences I understood and accepted, but Kyle’s role in some of them sometimes seemed . . . exaggerated. This is apparently why many people who I know in the military are not interested in seeing the movie or reading the book. What I’ve heard from many of them is that he spent too much time glorifying his personal experience. One of my relatives, who served two tours in Iraq and two more in the region, felt that his comments about the Iraqi people crossed the line of decency. As one reviewer on Goodreads stated, the promotion of recreational violence, hazing, and the depictions of officers having no control over subordinates depicts a military that is in decline. It seems that Kyle believed that being a SEAL gave him and his military brothers special permission to participate in excessive drinking and violence outside of actual military expeditions. He boasted about his multiple arrests and getting off without being charged. He practically bragged about missing his daughter’s birthday party because he was in jail for a barroom fight in Tennessee while at training. Perhaps that is what being trained to be an elite member of the military is all about. Perhaps that is what the military needs for special missions. The fact that Kyle is idolized for his 160 confirmed kills more than his actual skills speaks volumes, to me, about the love of guns and violence in our culture. There is no doubt in my mind that Chris Kyle was devoted to his military career and approached it with a great deal of respect and hard work. He might have been the right man for the job he had to do in Iraq. I read and felt that the movie, American Sniper, was a depiction of one man’s experience based on his life, personality, and temperament. Others in the military have other experiences based on their lives, personalities, and temperaments. One is not better or worse than others, necessarily. They are just different. I know veterans and members of the military who are truly silent warrior types. Kyle claimed to be one because many of his missions were secret and he was a SEAL, but he spent a lot of time in the book being a lot less than silent. He demanded respect for himself and his opinions, but held those with differing ones with outright hostility. 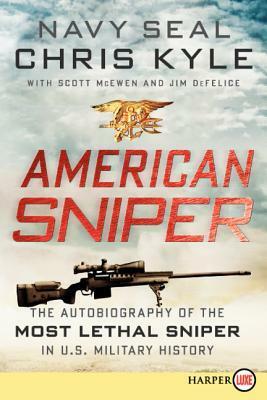 Was Chris Kyle a hero? Going to war and facing the enemy with little fear and a lot of bravery probably qualifies him as one for most people. Was Chris Kyle a deeply flawed man? Yes, by his own admission. He was confident to the point of arrogance about his role and job in the military. He neglected his family for love of the military and his country. At least he was honest about it. Do I recommend the movie and book? Yes on the movie and no on the book. Artistically, the movie was flawed, but Bradley Cooper did a great job, and it is enlightening to see the experience through Kyle’s eyes. I didn’t need to read the book after seeing the movie, and, in any case, the movie was better than the book. Who is the true hero of American Sniper? In my opinion, Taya Kyle, Chris’ wife, is the true hero. Taya provided a lot of text in the book, but does not even get mentioned or credited as a co-author. Taya Kyle, the woman who loved this man in spite of him placing her and their children last on his priority list for most of their married life. Taya said it best when she realized that his true family were his fellow SEALs and military team. Her excerpts provided the best insight into the true sacrifices faced by military families, and I’m glad they were included in the movie. I’m also happy that Chris finally connected with her and his kids in a positive way the year before his untimely death. Chris Kyle and a companion were killed at a gun range in February 2013 where they had taken a veteran they were helping who was suffering from PTSD. It seems to be the ultimate irony that Kyle ended up being killed by one of his military brothers with one of his own weapons. The movie was being filmed when this happened, and a decision was made to include it as the ending to the movie. Sometimes truth really is stranger than fiction. And sadder. Note: So what was my pick for Best Picture? I felt that Birdman would win and it did. Why? Because it’s a story about actors and the award is for acting. They were rewarding their own angst. This doesn’t take away from the movie which I thought was really good, and I really love Michael Keaton in general and in this role. I would have been happy if Boyhood (seamless transitions considering the length of time over which this movie was shot), The Imitation Game (Benedict Cumberbatch, what more can I say? ), The Theory of Everything (Eddie Redmayne totally killed it and deserved Best Actor), or Selma (should be a must see for high school history classes) would have won. The Grand Budapest Hotel was artsy and quirky, and I love that. Whiplash was really intense, and I am so happy that J.K. Simmons won for Best Supporting Actor. This entry was posted in Travel & Entertainment. Bookmark the permalink.